Aggressive dog behavior is one of the most troubling experiences an owner can face. Due to the inherent dangers of your dog biting another dog or person, training an aggressive dog should be done as quickly as possible in order to keep yourself, others, and your pet safe. Provided below is an informative guide intended to shed light on how to train an aggressive dog. Please note that aggression should be worked with carefully, and enlisting the help of a canine professional is recommended if aggressive behavior does not subside. Additionally, a dog that has recently developed aggressive tendencies should be taken to a veterinarian for a complete exam in order to rule out an underlying physical or neurological disorder. Below are some helpful aggressive dog training tips. 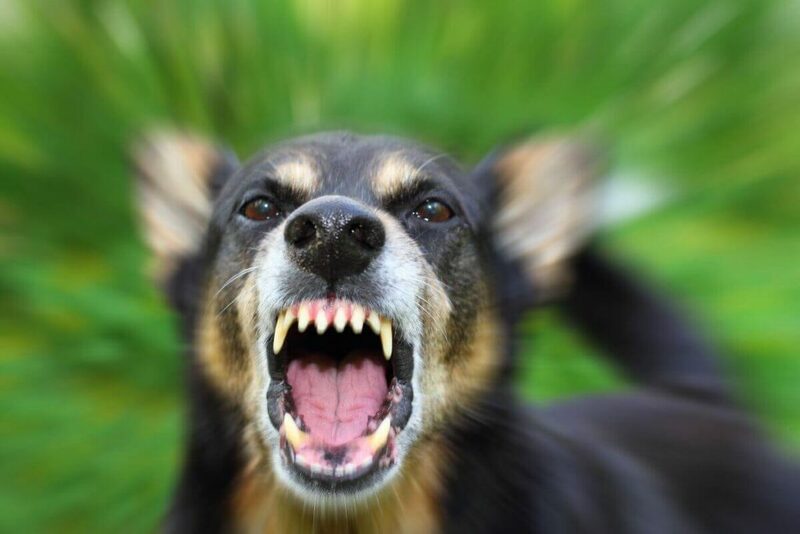 Aggressive behavior can manifest in a number of ways, but first an owner should rule out whether the dog is behaving aggressively or is simply playing inappropriately or dominantly. Aggressive dogs will almost always give warning before displaying inappropriate behaviors. Signs of aggression in dogs include a raised tail, curled lips, standing stiffly with weight on front legs, growling, snarling, and raised fur in response to stimulus. Aggressive behavior in dogs should not be taken lightly and you should remove your dog from the aggression-causing situation immediately. However, if your dog is nipping or biting while playing and the other dog is not yelping in pain, or if your dog is correcting other animals by nipping at them on the nose or ears, the problem is dominance related and should be handled in a different way. A common form of aggression is dog on dog aggression, where a dog only behaves aggressively towards other animals. Dog on dog aggression in the home or yard is common, and typically stems from your pet being territorial or guarding its resources. Other forms of dog on dog aggression may stem from fear, especially if your dog’s history is unknown. Dog aggression towards other dogs should first be dealt with through socialization. Take your dog on walks where you know other animals will be present, such as at a park. Start working with your pet at a distance from other canines and give positive praise for good behavior, such as not barking. Over time gradually bring your dog closer in proximity to other pets to help him realize that other dogs are nothing to fear. Dog aggression towards owner or other humans is the most serious type of canine aggression and should be handled with utmost care. Dog on human aggression may stem from a number of reasons, including resource guarding or fear. When the aggression is directed towards the owner, aggressive dog training should focus on setting boundaries and maintaining routines. Setting rules for your dog is important, including making him sit before eating or being let outside, not giving in to his begging for attention, and not allowing your dog to hog the bed or couch. Never roughhouse with your pet while playing or punish your dog physically, as both could send mixed signals. If your dog displays aggression towards other humans because of territorial tendencies or due to resource guarding, socialization with a trained professional is recommended. A food aggressive dog is one which snarls, growls, bites, or snaps when another animal or human approaches during meal time. Food aggression in dogs is common among those that lived as strays, those that were the runt of their litter, and dogs that live in multi-pet households. Overcoming dog food aggression takes patience, trust, and practice. The first step is to desensitize your dog to having others near his food bowl. Start by hand feeding your dog with an open hand. This will help your dog not feel threatened if anyone reaches near him while he is eating. Next, toss treats to your dog during meal time to help your pet have positive associations with people near his food. Finally, approach your dog with a high-value treat (i.e. meat or cheese) while he is eating to reinforce that people near the food bowl can be a positive experience. Dogs have a fight or flight response to stimuli that cause fear, and fear aggression in dogs manifests when the “fight” option is chosen. Dogs may lash out for a number of reasons, such as when they feel cornered, when a child is poking or prodding, or if another animal displays overt dominance. The key to rehabilitating a dog with fear aggression is socialization and desensitization. Slowly introduce your dog to the scenarios he finds scary while providing positive praise. Fear aggressive dog training can take a long time, depending on the experience that caused the dog’s fear, so having patience is extremely important. Territorial aggression in dogs often manifests because of improper introductions to other dogs. When bringing a new canine friend over for your pet it is important to introduce the dogs in a neutral territory. A nearby park or hiking trail would be a good choice. When performing the introduction, never let both dogs sniff each other face to face. Instead, encourage the dogs to sniff one another’s butts. Next, take the dogs for a walk together while praising your pet for good behavior. Repeat the introduction process in front of the dog’s house, then move to the yard, and finally repeat the process again in the house. Be sure that both dogs are leashed for the duration of the introduction, as having one dog loose and one dog confined can cause anxiety for the leashed pet. A second cause of territorial aggression is poor socialization. If a dog has not been properly introduced to as many new experiences, dogs, humans, sights, and sounds as possible he may become overly territorial and fear others in his space. That’s why it’s important to begin socializing a new puppy as early as possible. Working on proper socialization early on can help eliminate this bad behavior. Aggressive dog behavior training is primarily focused on redirecting fear and negativity into positive experiences and can be highly effective for most canines. Remember…..patience, persistence, and plenty of praise are the key.